Motos in Moab: For the Love of BRAAAP! Motos in Moab 2015: For the Love of BRAAAP! Motos In Moab was almost a gigantic failure. 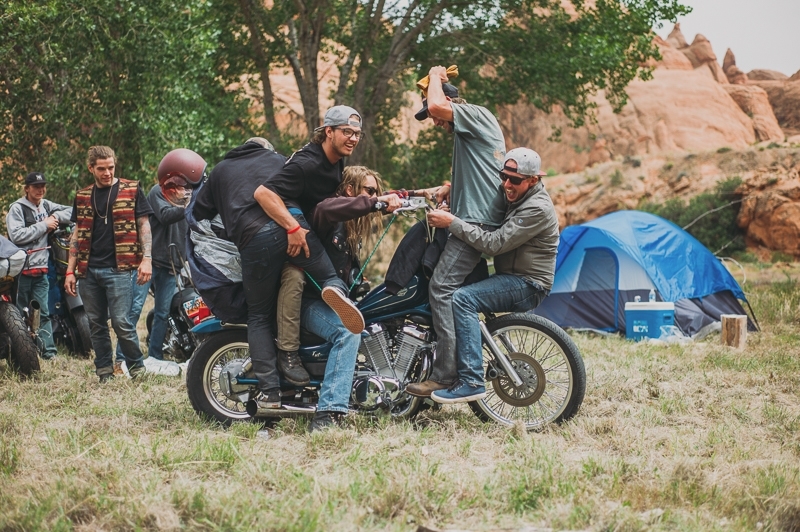 The first year motorcycle rally/ride/event/gathering was plagued with problems and hang-ups throughout the entire four day event, including but not limited to: a flood, confrontations with Moab PD, countless broken motorcycles and getting kicked out of a campground. Despite all this and more, most participants would likely say that the event was more memorable, more thrilling and more fun than they expected it could be. Some chose to depart from Salt City Builds the morning of Friday, May 22. Countless others set out from other states including California, Idaho, Texas, Minnesota and Washington. It rained on the riders for most of U.S. Route 6, soaking them and causing them to hunch on their bikes to retain warmth. One rider’s gear shift lever detached from his bike and flew through the group of riders, narrowly missing them by inches. Salt City Builds did some quick roadside repairs and the group was on its way again. Upon their arrival to Pack Creek Campground in Moab, riders found groups of motorcycles surrounding tents. Organizers greeted them, handing out T-shirts and directing people where they could set up camp. It was all quite structured, and seemed to be going smoothly. Only a few hours later, after everyone set up their tents and cracked open the libations they had brought along, the group began to be harassed by the camp host, who stated that they were being too loud. The acceptable noise level of 200 or so motorcyclists is unknown, but apparently the threshold had been broken. Organizers say the campground host had previously verbally confirmed that the grounds would be acceptable for such an event—noise and all—but regardless of what was agreed to, the sheriff showed up and that was the beginning of the end of the group’s stay at that campground. Over time, this event will grow in the minds of those who were there. The sheriff will remember how he removed a murderous, blood-soaked biker gang from his town, and the bikers may recall billy clubs brought by PD in riot gear. Though, what really occurred was much more benign. When everyone awoke the next morning, they were forced to pack up and leave, surrendering most of the fee for the three day reservation. The sheriff looked on as everyone scrambled to break camp, not knowing where to go from there. With the situation at third and long, the organizers pulled off a miracle and secured a new site just out of town in the lower Colorado River canyon. It was a gigantic field filled with weeds and red ants as big as fingernails, flanked by giant red rock walls and the green-brown river. When they arrived, the owner of the property was mowing down the weeds and using a front loader to build a gigantic pile of firewood. A barbecue food truck had followed them in and was setting up shop to provide ribs on demand for the duration of the stay—they had found motorcycle rally heaven. That evening after setting up camp, organizers touched two glowing torches to the fuel-soaked wood pile, creating a massive bonfire. The braver among them rode circles around the inferno, some sliding out and nearly falling into the large fire—the heat of which was almost unbearable, even when standing 10 feet away. The sun had set and people began to finally relax. It came fast and hard, and a small runoff ditch next to the field became overburdened, sending streams of water through the camp in all directions. Chaos erupted as people scrambled, attempting to move gear to higher ground. Motorcycles were sinking into the mud as water rose six inches in some places. The bonfire sizzled and hissed as water rose around it. Some tents had been uprooted and were literally moving—pushed by the water. Many people gave up—packed their things and left—but most stayed. They tromped around in shin-deep water, helping those who had been out riding when the rain had come. They also worked to push motorcycles out of the muck, most being street bikes which usually never leave pavement. After an hour the rain lessened, and slowly the water levels in camp subsided. Attendees wandered in search of warmth and company between the many campfires. People offered chairs, water, fire, food, beer and cigarettes to those who had none. It was a bucolic commune, with strangers uniting as friends through a mutual love of motorcycles. The new camp location was outside of cell carrier coverage, which meant that none of the people there could be found staring at their phones—not that they would want to with so much going on. It was a reminder of the days when people entertained each other by telling stories and jokes. The police stopped by again, though this time they were friendly. They asked about the bonfire, though they eased up when they learned that it had been sanctioned by the owner of the property. Someone gave the cop the latest issue of Iron & Air and wished him well. This day—the first without any major hurdle—was spent by attendees riding the various canyons and roads that the area has to offer. People swapped bikes and helped each other make small repairs. Some rode with old friends and some made new ones. Large lines of bikes could be seen on Main Street in Moab, where people were meeting for lunch, surely shaking the locals who are used to seeing geriatric leather-clad retirees ride rolling couch style motorcycles in town. The majority of the group were 20-somethings with greasy hair and loud-as-hell pipes—half of them women with their own bikes. 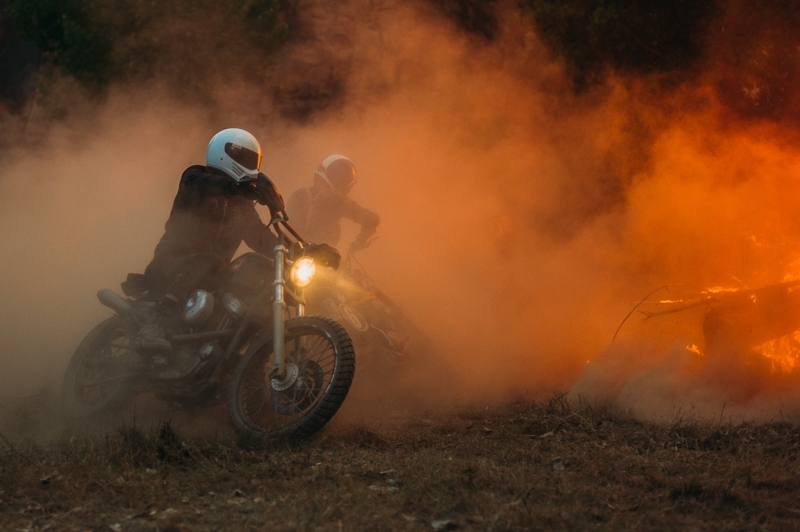 That night attendees built another giant bonfire and hundreds of dollars of free gear were given away—donated by national players in the motorcycles world. This was a sign that Motos In Moab was not simply a diminutive Utah event, but a national event organized by Utahns. With nice weather and no impending doom, the camp settled down for the final night of fireside chats, shared whiskey and bright desert stars. The next morning everyone packed up and slowly departed with bikes overburdened by gear. People who had been strangers three days previous shared hugs and swapped phone numbers, promising to keep in touch. Motos In Moab was like an adult summer camp, but louder and requiring multiple visits from the local sheriff.